GPC have been engaged to provide consultancy services to seek a Planning Permit for a new mixed-use residential development. The development is situated in the heart of South Melbourne, lining Gladstone and Ferrars Streets and is within metres of the Port Melbourne/City Light Rail. The project will consist of 2 residential towers of 35 levels comprising of 1, 2 and 3 bedroom apartments with a mix of retail and commercial premises on the ground floor. The development has the potential for 400 apartments. This site doesn't have stipulated height limits in the draft plan though does it? The maps included in the draft vision plan are very poorly detailed but it looks like this site is identified as a precinct park! The sites across Kerr Street are identified as having a proposed 18 storey height limit, but nobody knows if these will be mandatory height limits or just recommended height limits. I would be concerned about the close proximity to the Southbank tram depot directly across the other side of the lite rail, with all that noise from 4:30am till 2:00am every day wont be popular . No new news in that article, all of it was contained in the vision plan. The article also does not seem to understand that the area today has no height limits at all so the new height controls will only limit development. Also the height controls will be discretionary not mandatory. Would've also thought it would be easier to change a few colours on a plan before the final Structure Plan is released early next year than sending developers and their design teams back to the drawing board. 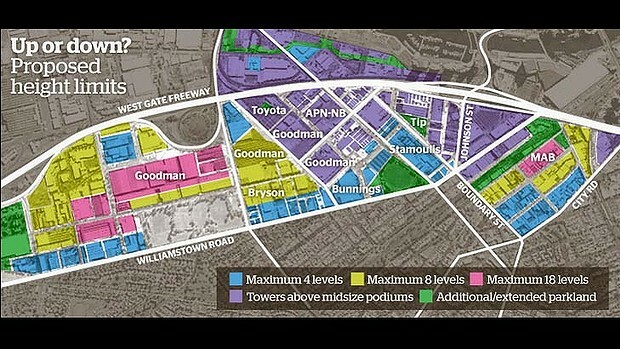 I think some shuffling of heights is required with the area bound by Thistlethwaite, Montague, Whiteman and Gladstone Streets designated towers above podiums, a better transition of height from Southbank and One Melbourne - with the strip north of the parkland limited to 4-8 storeys. Otherwise you'll end up with parkland that's in constant shadow from about 11am. The developer behind two proposed towers in South Melbourne in the Fishermans Bend urban renewal area, has lost patience after almost two years of waiting and taken Planning Minister Richard Wynne to the state planning tribunal. Map Coffee entrepreneur Pitzy Folk has built a distribution warehouse for his drinks business at 2-4 Buckhurst Street in South Melbourne. Since September 2013, he has been trying to gain approval from successive planning ministers for towers designed by architects Jackson Clements Burrows on the site. In 2012 Mr Folk's island site was identified as a possible future site for a park.